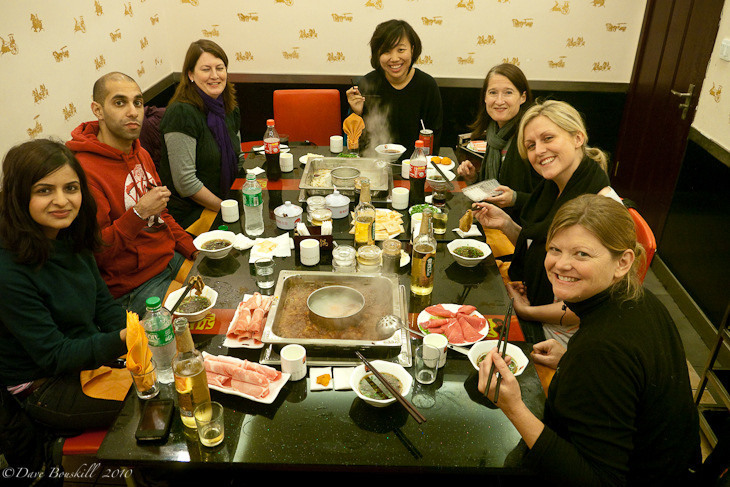 One of the most exciting meals we have had during our travels is the Chinese hot pot in Sichuan Province. Known as the province of flavour, Sichuan is famous for it’s over the top spices. We hopped in a taxi with our hand written directions in Mandarin guiding our driver to the neighbourhood Hot Pot restaurant where the festivities began. She was our translator for the night and she wrote the note with the name and address of the restaurant on it. We never would have made it there without her. Note: It is difficult if not impossible to find an English speaking taxi in China and when leaving your hotel it is important to bring a card with the address clearly written on it with you. We were led to our private room where we sat around a large table with to sunken burners in the centre of the table. 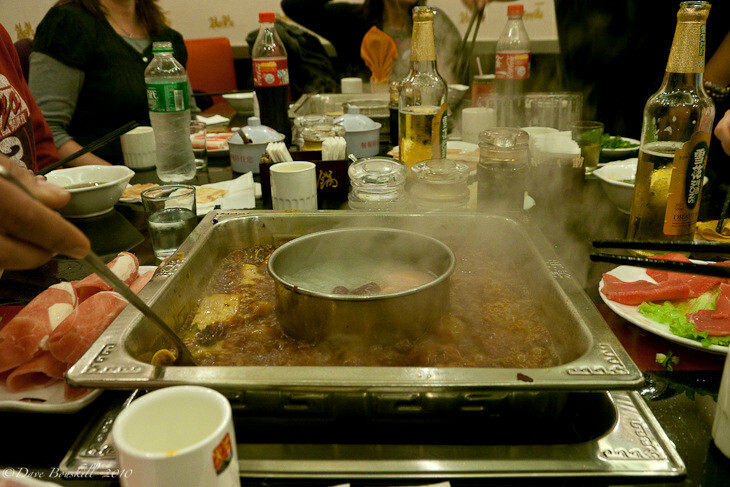 Dining moves fast in China and within minutes the hot pot spicy water was sizzling while meat and vegetables made their way into the room in endless supply. With an array of meats from beef to lamb to fish and pork we dipped our portions flesh into the spicy hot water. It wasn’t all meat though, strips of tofu skins and fresh vegetables were on the menu as well and as each item cooked, we scooped it out of the pot and dipped them into our sesame oil mixed with coriander and garlic. There is something special about cooking your own food when dining out. Everyone is excited over the process and the conversation is lively and energetic. 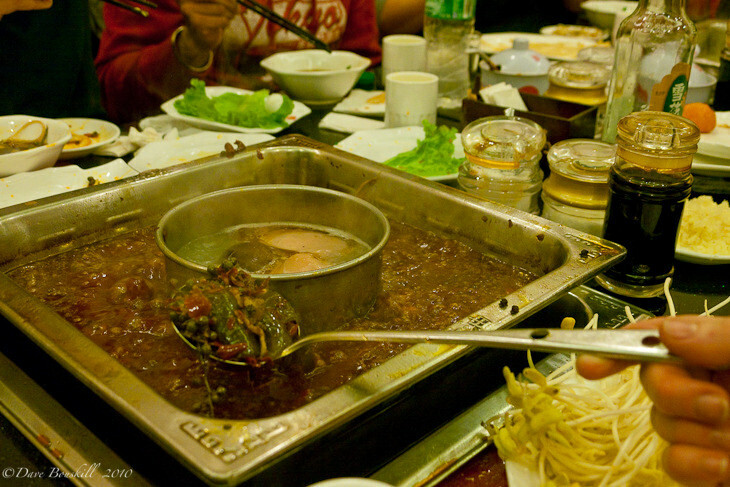 Plates of meat and vegetables suitable for dipping are placed around the hot pot. Each person picks up the meat with their chopsticks and drops it into the Sichuan spicy oil. The meat cooks quickly and you can either pick it out with your chopsticks or fish it out with a large spoon. Once you have your meat in hand, you dip it into a mixture of sesame oil. This cuts away a bit of the spiciness leaving an incredible flavour. The Sichuan hot pot isn’t served with rice or noodles. It is all a perfect blend of meat and vegetables. It takes time to eat as you cook and dip one piece at a time. A Hot Pot meal is an event. It’s an entire evening out with friends. It is too be savoured and enjoyed, not rushed. You eat a little and then you relax and then you eat a little more. At first, we didn’t find the hot pot too spicy but as the water boiled and the spices grew stronger we became almost hysterical with laughter as we choked on the hotness and our tongues became numb. We had discovered the wild pepper of the region in our pots. Huajiao is a key component in the Sichuan Hot Pot. One bite into it and your mouth instantly goes numb. Not only do you feel a strong burning sensation, but also numbness comes over your entire mouth. We would eat a portion of meat, suffer over the heat and laugh about going numb. Once the burning calmed down and we could properly speak we started all over again with the next morsel. Beer helped to calm the spiciness of the hot pot peppers. It was a joyous feast that gained momentum and energy as the meal went on. Just when we thought we were finished, more food was discovered and the crab rolls, green beans, mushrooms, bean sprouts, tofu cubes and potatoes came rolling out. It seemed as if the bean sprouts and tofu soaked up the spices more than anything else we had eaten so far. When we someone choked on a piece of spicy tofu, another person just had to try it to see for themselves. Once they choked on the spice, they could verify that yes indeed, that hot pot is spicy! We made a thorough mess of our private dining room and worried that we were terrible eaters of hot pots. What must the Chinese waiters think of our messiness? However, on our way out the door, we looked into another private room and saw food, napkins and cigarette butts all over the floor with grease spilling onto the table. We grabbed a taxi and paid our 8-Yuan (about 1 USD) for the cab back to our hotel. With our hotel's business card in hand, we almost made it back without a hitch. We saw our hotel in on the other side of the road, but we couldn't communicate to our driver that it was there. We tried to tell him that we were almost at our hotel, but he didn't understand and we didn't speak Mandarin. He had to stop to ask for directions almost directly in front of our hotel. Note: This trip is sponsored by Intrepid Travel. 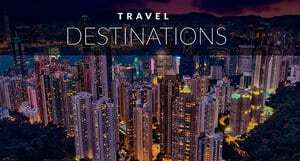 We are taking part in the Grand China Tour from Hong Kong to Beijing and are sharing what it is like to travel as a group as opposed to solo travel around the world. So far, we are loving the Intrepid experience. With it’s grassroots way of travel, we are getting the best of both worlds. 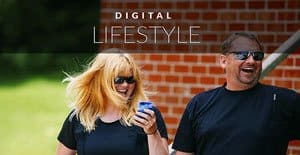 Our group is small at only 7 and we are given enough free time and experiences at local establishments to enjoy the freedom of independent travel with the comforts of having someone take care of the logistics and headaches. 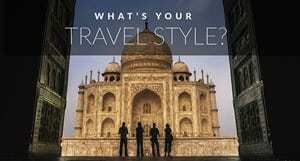 It is an excellent choice for someone looking for an off the beaten path holiday. « Hot Cupping: Therapy or Just Pain? 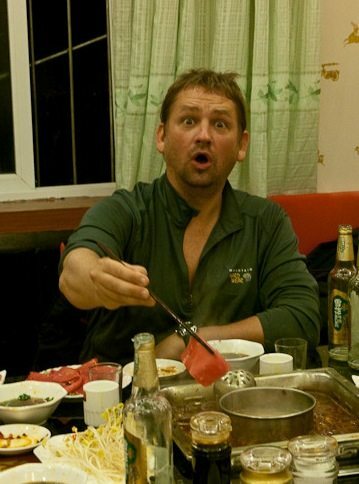 16 Responses to "Sichuan Hot Pot, A Sizzling Night out in China"
.-= Gray´s last blog ..Hotel L’Annexe- A Budget Paris Hotel for the Solo Traveler =-. This looks so delicious! I will have to try this when I go to China. 🙂 Cooking your own food looks very fun. I can tell you are really enjoying your tour! .-= Jennifer Barry´s last blog ..Stranger in His Own Land- Part 9 =-. .-= Theodora´s last blog ..Seeing Stars in the Outback =-. That looks so good. I love a good hotpot in China. 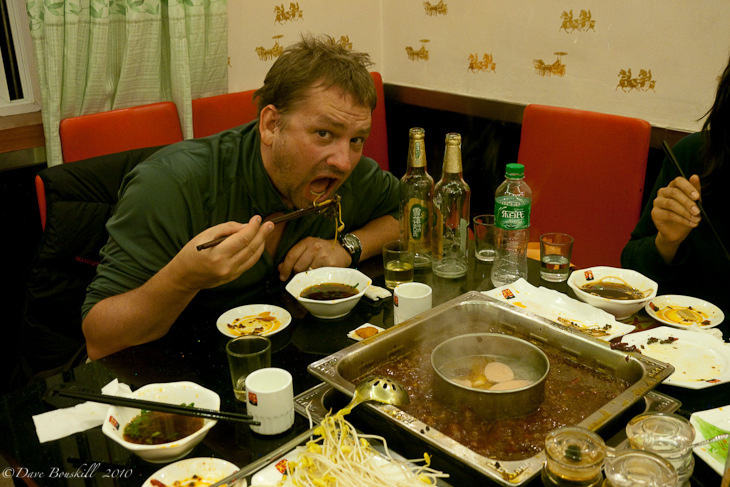 Last time I was in Chengdu, the hotpot had me dying but I couldn’t stop eating it. .-= Michael´s last blog ..Burn Plastic for More Space =-. 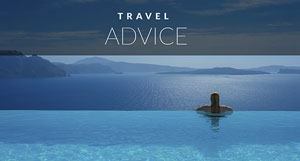 .-= Trisha Miller´s last blog ..How to Get Invited on Press Trips =-. So jealous! I’ve gone for hot pot lots of times in Toronto but it doesn’t quite look the same. I need the spicy stuff on the outside. We haven’t gone for any hot pots in Toronto, we will have to try it when we get home to compare the difference. I’ll bet that they don’t have the numbing spice that they have here though. It is very strong and certainly gives you a burst of energy and adrenaline when eating it. .-= Alison´s last blog ..Brussels Christmas Market – Plaisirs d’Hiver =-. That is an excellent way to put it. We definitely got our spice on! Sichuan hot pot is just awesome. I became addicted to the numb feeling and spice of the peppers. When we first started our Sichuan hot pot, we didn’t know about the sesame oil and then the waitresses saw our whole table struggling so they came over and started to demonstrate how to eat properly. So good. .-= Audrey´s last blog ..An Evening with Refugees- When Going Home Isn’t an Option =-. Audrey, I can see how you became addicted, the numb feeling is a fun sensation. People in China have been so friendly and helpful, it doesn’t surprise me that the waitresses helped you out, they have been the sweetest and kindest people.